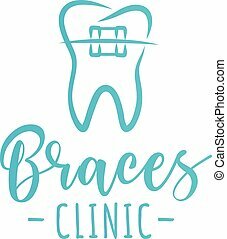 Braces logo design. Vector icon with blue color, isolated on white background, creative logo. Braces clinic design concept. Symbol of a tooth with braces. Vector illustration. Tooth Logo Design, Dental Icon, Vector Illustration. Real estate logo, circle design. Connecting logo design, C logo. CC letter logo, simple design. Q Padlock logo, square design. letter E logo, business logo, vector icons. vane logo, circle logo design. vector icons. business logo design.